Wedding images are why couples make such a huge investment in and make wedding photographers their top priority in their budget for their wedding. Most wedding clients look at the variation of different wedding photographers. 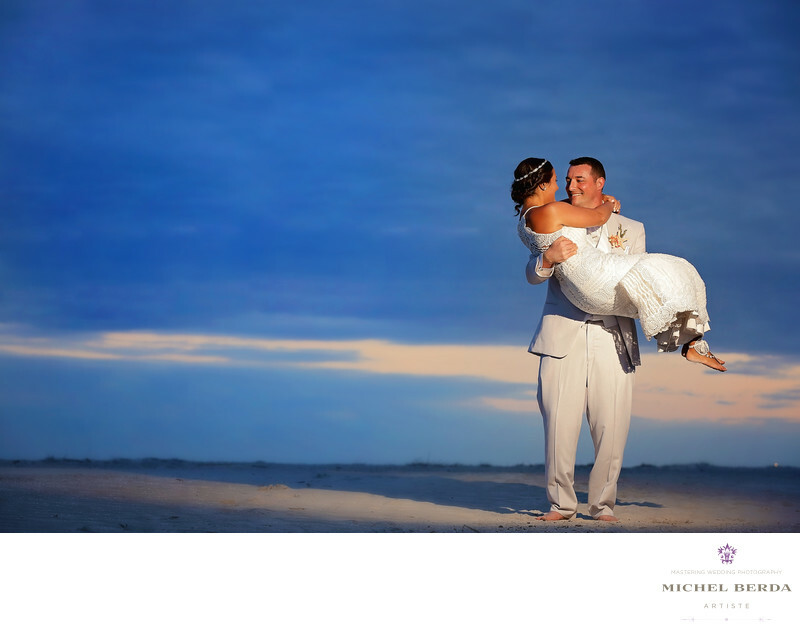 They look at each and every wedding photographers website to establish what makes a compelling wedding image or images. In today's technology cameras do pretty much it all, with a large screen in the back you get a general idea of how your images will look. But that is not good enough. Qualified, artist, with many years of experience, become masters in lighting a subject.That is what makes a wedding photographer shine from any other wedding photographer. It is and always will be unique quality in a wedding photographer. .Here is a perfect example, of a well-lit image, that I captured as wedding photographers at Sonesta HHI. We were expecting an incredible sunset at Sonesta HHI but it never happened. This is when proper knowledge of equipment and lighting comes into play. You see your clients are always ready to take amazing wedding images of their special day, however, they are not willing to wait a very long time for you to take that picture. For me balancing ambient light and mixing in the proper amount of strobe lighting also know as a flash, is math, science and lots of experience in the right calculation. there are many wedding photographers that the clients could have hired for their wedding at the beautiful venue of Sonesta HHI, and they knew when they saw my portfolio that no matter what the day looked like and under any situations that I would control the light given to me and make the perfect wedding image.Keywords: beach wedding photographer hiton head island (3), HILTON HEAD ISLAND WEDDING PHOTOGRAPHER (18), Hilton head wedding photographer (6), Michel Berda (1140), photographer (1125), Sonesta resort hhi wedding photographer (3), Wedding Photographer (1254), wedding photographer sonesta resort hilton head island (3), wedding photographers sonesta resort hhi (3).